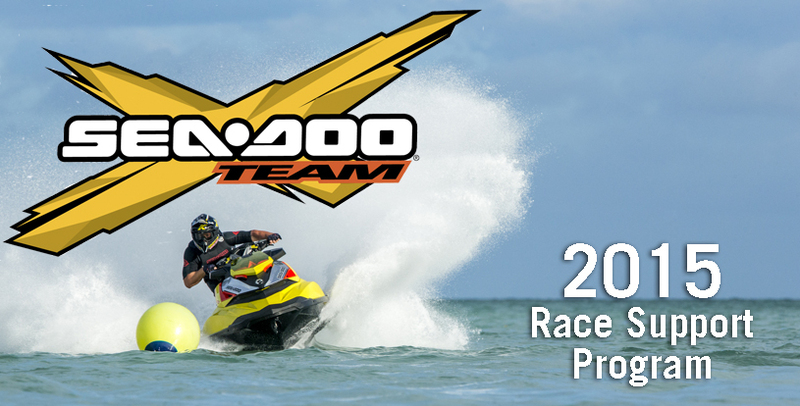 Valcourt, QC, CANADA– February, 17, 2015 – BRP announces an unmatched level of race support in North America for those competing on modern Sea-Doo watercraft through the 2015 Sea-Doo X-TEAM Bounty racer contingency program and Sea-Doo X-TEAM event support program. BRP has set the benchmark in watercraft runabout racing over the past 20-plus years, with an unprecedented run of Pro World Championships since the introduction of the Sea-Doo RXP-X 260 with Ergolock and T3 hull. The 2015 Sea-Doo X-TEAM Bounty program contributes more contingency money than any other program in the industry and makes it available to all Sea-Doo riders competing in the various disciplines of watercraft racing in North America. BRP also ensures there are more race events across North America through the Sea-Doo Promoter support program. BRP’s Sea-Doo X-TEAM Bounty is open to ALL racers competing only on modern Sea-Doo models in designated classes. The Sea-Doo X-TEAM contingency is essentially an, “open-sponsorship”. In addition to the glory that comes with winning on Sea-Doo watercraft, comes the opportunity for extra prize money. The Sea-Doo events team will also present the Sea-Doo X-TEAM Pro Pit Lounge at various race events where friends and family of Sea-Doo racers can enjoy special BRP hospitality and a VIP experience. The Sea-Doo X-TEAM Event Support program provides event promoters sponsorship to help them produce additional, high-quality, fun events. BRP works with promoters to ensure Sea-Doo performance enthusiasts have a place to ride and compete in an organized manner, providing another fun aspect of owning a Sea-Doo watercraft. “BRP markets the best in performance watercraft with the Sea-Doo X models and supports those winning races on them with the strongest contingency program in the industry, the Sea-Doo X-TEAM Bounty,” says Tim McKercher, of Sea-Doo watercraft competition management. “BRP takes the lead in supporting the sport, ensuring watercraft owners have more,,good events to participate in. The Sea-Doo X-TEAM event support program helps promoters produce even more higher quality events. BRP does more for the sport of watercraft racing than any other company. For 2015, Sea-Doo X-TEAM program support begins at the 11th annual Mark Hahn Memorial 300 endurance race taking place in Lake Havasu, Arizona February 28th. Click for complete 2015 Sea-Doo X-TEAM Bounty details. Click for information on the Word Championship winning Sea-Doo watercraft performance models.